The Trimble® MPS865 is a highly versatile, rugged and reliable Global Navigation Satellite System (GNSS) marine positioning solution. Features maximum connectivity – Bluetooth, WiFi, UHF radio, cellular modem and two MSS satellite correction channels channels. Trimble Geospatial Announces UASMaster 9.1 Now Available! UASMaster offers a complete photogrammetric processing workflow combined with automated and interactive editing, refinement and mapping tools to generate high precision point clouds, vector maps and true orthophotos. Designed to help surveyors in a wide range of industries work more effectively and productively, the Trimble R10 GNSS receiver enables reliable, fast and accurate collection of survey data in the field. Firmware Version S1.106.6 for SX10 Scanning Total Station is now available via Trimble Installation Manager. The aim of this presentation is to demonstrate how object-based analysis of these environments has been applied to differentiate between submerged mapping categories over small and large spatial scale and for multi-temporal analysis. LSU C4G says, “Thank you” to all of our loyal clients that have made it possible for C4G infrastructure and research to continue over the last ten years! NEI & Trimble Present Two Upcoming #WebinarWednesday Opportunities! TBC v3.82 is Now Available for Download! Trimble’s newest Survey/Construction/Monitoring Solution is now available on the NEI website! Click Here to view the Trimble S5 Ti-M Total Station. Trimble AccessSync version 2017.00 Also Now Available! Trimble Access version 2017.00 Now Available! NEI Priority Support now has even more advantage with the addition of the NEI Loyalty Program! NEI is Hiring! We are looking for our next great Geospatial Sales Manager. NEI is Proud to Offer Products and Services from Trimble for Federal Customers using GSA ! Contact your NEI representative today for your GSA quote: nei@neigps.com Click Trimble GSA 2016 for more information. UAS Legal Path to Fly Opens Up, Up, Up! NEI Honored to be Trimble’s 2015 Worldwide Dealer of the Year for Mapping and GIS Solutions! This firmware version includes improvements to the Survey Receiver firmware. NOTE: For best results, users should upgrade to Trimble Access 2015.20 or later when using Receiver Firmware version 5.11. We are pleased to announce Trimble Business Center software v3.60. This release provides many new tools and enhancements in CAD, Drafting, Network Adjustment, Feature Code Processing, and much more. Trimble introduce the TDL2.4 radio which allows users to connect to a Trimble Robotic Total Station using a Controller running Trimble Access 2015.20. The TDL 2.4 Radio provides a wireless connection to a controller (without internal radio) via a Bluetooth connection and the TDL2.4 radio connects to the Trimble Total station through the Trimble typical 2.4 GHz connection. Trimble has added new functionality to our GNSS receiver firmware for the current Trimble R10/R10LT and Trimble R8s. The latest firmware version (v5.03, released June 2015) and later, automatically checks if new radio firmware is required when loading receiver firmware. Note the affected receiver part number table below. SUNNYVALE, Calif., Aug. 25, 2015—Trimble (NASDAQ: TRMB) announced today the ZX5 Multirotor Unmanned Aircraft System (UAS), a new aerial imaging and workflow solution that captures and processes geo-referenced photo and video data for mapping, agriculture and inspection applications. The Trimble® ZX5 complements the UAS portfolio with the ability to reach smaller, remote environments faster, while providing accurate mapping data for improved productivity in the field and back office. With the ZX5, Trimble extends its unmanned aerial portfolio to include both fixed-wing and multirotor solutions, providing customers with a choice to meet their specific requirements. Trimble’s fixed-wing UX5 provides longer flight capabilities for large, open environments including farms, mines, canals, flood areas and forests—while the ZX5 is more suited for mapping smaller sites, including facades, obstructed areas, construction sites and standard aerial mapping applications. NEI hosts Trimble UX5 Unmanned Aircraft Webinar!! Interior construction lasers are 31 years old this year, and to the joy of many, that first big baby was followed by many smaller, and smarter, relatives. laser company in the world. Today it is known as Spectra Precision. Theodore Maiman grabbed the worlds attention in 1960 when he introduced the first laser, but so ready was the world for this technology that within months many other scientists had duplicated the feat with different materials—Maiman later joked that nearly everything scientists touched seemed to lase. Trimble has made every effort to ensure our receivers will work seamlessly through the addition of one leap second on July 1, 2015. Our current firmware fully supports the introduction of a leap second on July 1, 2015. Trimble® Business Center office software is ideal for working with all types of geospatial data. The software provides numerous innovative and powerful features, and it is easy to learn and use. NOTE: For best results, users should upgrade to Trimble Access 2014.20 or later when using Receiver Firmware version 5.01. NEI Service Department Continues Preventive Maintenance Specials – ALL SUMMER LONG! C4GNet Introduces it’s Automatic Rover Fail-Over System! NEI has a new YouTube channel containing Trimble hardware and software how-to videos all in one location. Check out the NEIGPS You Tube channel and please subscribe to our channel. HYSWEEP Multibeam Courses! Register Now! How Trimble Pipelines Optimize Surveys in the Field and Office? How can Trimble Access Pipelines Optimize Pipeline Surveys in the Field and Office? How can Trimble InSphere Maximize your Productivity? Are you tired of Esri’s ArcPad Low Memory errors on your Trimble Mobile Device? HYPACK 2015 Training Event: San Antonio, TX – SAVE THE DATES! Didn’t think HYPACK could get any better? THINK AGAIN! HYPACK 2015 Training Event will be held from January 5th-8th, 2015. New features include: – New Anchor Handling Routine – New 3D Real Time Point Cloud – New Water Column Integration Visit http://www.hypack.com/hypack/2015/ for more information! What’s New in Trimble InSphere? Travis Matte Biggest Winner at 2014 Cajun & French Music Association Awards Ceremony! Carlson Survey 2015 is HERE! Trimble Trade In Days Extended until October 3rd, 2014! Total station coverage includes one Inspect-Clean-Calibrate service per year for each year of coverage purchased. Cosmetic damage that does not affect product functionality will continue to be excluded from warranty coverage. Trimble Dimensions 2014 – Save the date! Congratulations to the Spring 2014 Lafayette,LA Chapter Dale Carnegie Graduates! NEI was well represented by Lane Leblanc, Kevin Cormier, and especially MGIS Trimble-Certified Repair Technician Kris Comeaux, who also took home the Highest Achievement award! Congratulations to all of you! Job well done! March 16th-22nd, 2014 is National Surveyor’s Week! FREE Webinar Trimble V10: Advanced Imaging Solution! Trimble Access software version 2014.00 has been released! Trimble RealWorks – TRW 8.0.3 – What’s New? Cyber Monday Free Shipping Special! 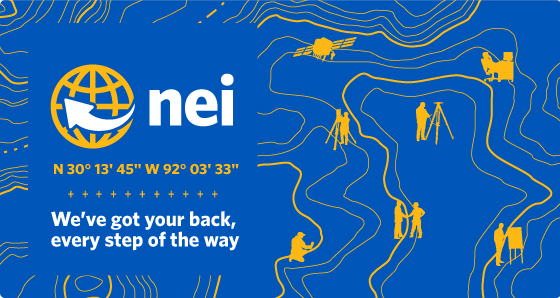 NEI To Exhibit at ESRI UC! NEI’s Mapping and GIS staff will be exhibiting at the 2013 ESRI User Conference in San Diego, CA the week of July 8th. Come find us at booth #510 and meet our knowledgeable staff. We will also host a Q&A session to answer your product and technical questions on Wednesday July 10th @ 9:15am. Realize a New Standard for Surveying & Mapping – Live Webcast! NEI will be exhibiting at SEUC April 29-May 1. Come visit us at booth 123! 48″ Survey Laths/Stakes Now Available! Trimble Positions for ArcGIS Mobile and ArcPad 10: What do I need to do? What works with what? Get a $1000 credit towards a year of VRS service with purchase of Trimble GeoXH and Trimble field software. Trimble V4.70 WINFLASH/Firmware and release notes are now available for Trimble R10, Trimble R7 and Trimble R5 Receivers. View Link Here. Check out the NEI Commercial!